Pictures and words that document the conception, design and birth of an extraordinary modern-industrial loft house in Minnesota. If it weren't for being packed with grout, those ouchies and BIG CHUNKS OF MISSING FLESH would have been a bloody mess. Ouch was the understatement of my entire last week, actually. 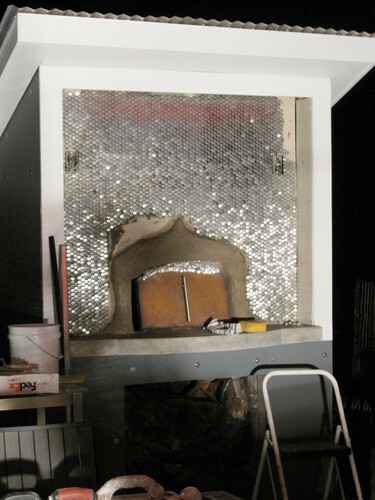 Here's the start of the 3D wood-fired oven mosaic adventure from hell that led to a week of the utterly useless and extremely painful fingertips pictured above. 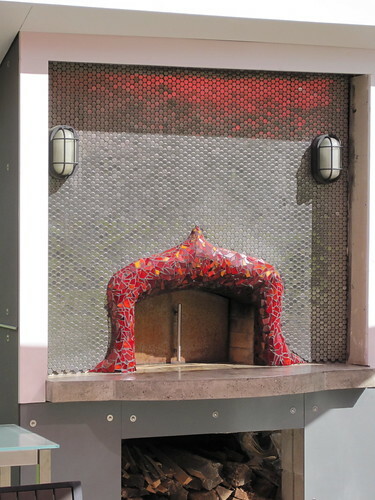 I wanted something dimensional to accent what is otherwise a very flat, boring facade, so I concocted a way to make a heat-proof sculptural element around the oven opening using a wire armature and vermicrete, aka a mixture of vermiculite and portland cement that I could cover with a colorful glass mosaic. While the vermicrete cured I started in on adding some totally awesome stainless steel pennyround tile to the main portion of the facade. Big splurge, that stuff. I think I once saw a t-shirt that said "mosaicists bleed for their art". I need one. Applying that gorgeous red glass to the 3D sculpture, no problem. Grouting around those razor sharp shards on such a dimensional surface, BIG, BLOODY PROBLEM. And a problem that I couldn't really bail out on once I'd started. Grouting is fun that way. But, as has so often been made clear in the whole WFO project, it's all worth it in the end, especially when the end is roasted meat! Big thanks to my pal Brian for the excellent food shot below. 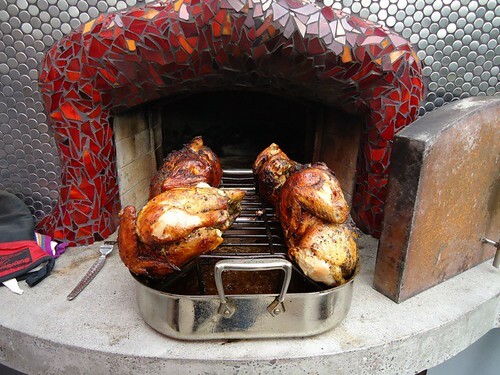 Following the mosaic carnage, I threw a party for myself that involved a keg of beer and six roast chickens, and the finger agony was forgotten. This is HANDS DOWN the best DIY project I've seen all summer... scratch that, all year! The end result is amazing, the colors are stunning and although in theory it should be far too much, its really just jaw dropping. Thanks for sharing your labor of love! I'm sorry about the battle wounds but this is absolutely amazing!! Well done!! 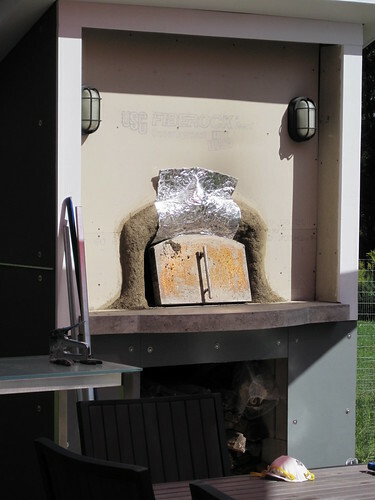 The oven looks fabulous. I love the many shades (shards) of glass, and I never saw anything like the stainless steel tile. Here's to quick healing! hubba hubba for the oven. 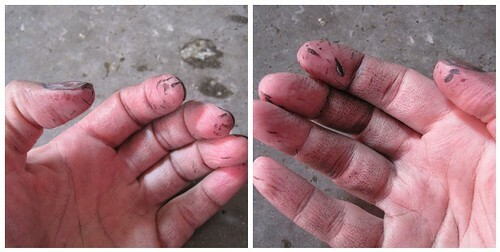 OUCH for the damaged fingers.... hope they heal quick - but probably having grout in the cuts doesn't help!!!!! WOW. If I had a WFO that pretty, I'd be out there roasting my corn flakes every morning. Food, Oven, Fingers - they all look incredible! I'm sorry for your injuries, but hot damn that looks AWESOME! Splatgirl your project is fabulous as always! Regarding fingers injured, maybe try wearing one of the new style coated garden gloves? Whoa! This is SUPER FANTASTIC! BRAVO! I just found my way over to your site and have to say your work is amazing! I wish I lived closer and could hire you out for ideas to remake my boring suburban home! i love mosaics. have only done a few small projects, but have collected a ton of tiles, and after visiting italy this summer, proceeded to scare the crap out of my gf by saying "i'm going to mosaic the whole house!" your oven is gorgeous, and the real reason i'm posting is to show you this, if you haven't seen it. that's f*cking awesome! Wounds can heal, and it will make every meal prepared in that oven that much better. Fancy flying to Jamaica and making another? UGH your fingers looked like hell! :( I guess it's worth it now, but damn I bet it was hard to return to the project each time. How many sessions did that red mosaic take? I love your interior railings. Did you do that yourself? And the kitchen, people try to talk me out of Ikea but I keep going back to browse. The oval tank toilet - I've searched for hours - no luck - who's the manufacturer? Don't stop - it's fascinating and makes me want to BUILD A CONCRETE COUNTER!!! Happily bucking the system since at least 1980. Wood Fired Oven, Now Open!